Our oldest requested Chinese food for dinner. Never having this request before from him, I was excited at the opportunity to try something new and expand both kiddos’ palates. When I was younger my dad used Yoshida’s cooking sauce for stir frys and to marinate meat, so when I saw Yoshida’s at Sam’s I picked up a bottle. The dinner turned out really well. The fish was excellent and the chow mein was really good too. I chose to bake the salmon, but you could easily broil or grill it. This meal, including marinating time was quick and easy and from start to finish only took 45 minutes. In a time crunch you could skip the marinating, but just be sure to baste the fish with the sauce. 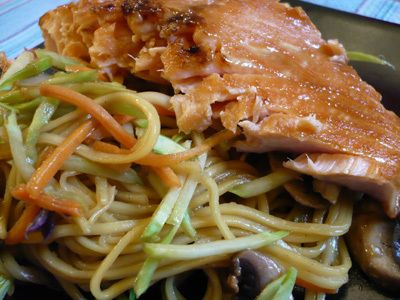 Salmon: Marinate salmon in 1/2 c. Yoshida’s for 30 minutes. Preheat oven to 350, remove salmon from marinade, place on a baking sheet and bake for 15 minutes, or until done. Chow Mein: cook noodles according to directions. Heat olive oil in a nonstick skillet over medium high heat. Add garlic and ginger, cook for 1 minute. Add broccoli slaw, and cook for another minute. Add the mushrooms, cook for another minute, then add the remaining 1/2 c. of Yoshida’s, then add the cooked noodles. Toss to coat.